Thread: DarkDemon: Did you know? A statistical analysis of DarkDemon, looking at the figures generated by the forum, and comparing it to DarkDemon's peers. The following websites were also used in this experiment: StickPage, PivotAnimation, FluidAnims and Droidz; considered by many to be the most popular stick animation sites. The data was collected on April 18th 2012. 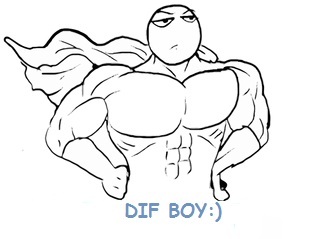 DarkDemon has a community of 22418 members, making it the second largest stick animation community. A large community is all well and good, but if no one posts, what's the point? With web technology such as bots, and users being turned away by closer inspection of the community, the next category to look at was user retainment. 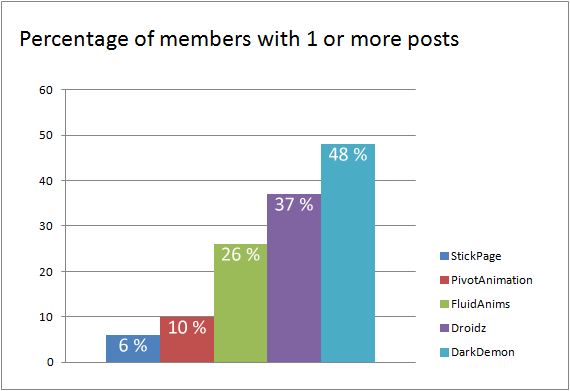 Of all of StickPage's members, 4530 of them has one post or more, of all the users that join only 6% of them post. Of all of PivotAnimation's members, 800 of them has one post or more, of all the users that join only 10% of them post. Of all of FluidAnim's members, 5250 of them has one post or more, of all the users that join 26% of them post. Of all of DarkDemon's members, 10850 of them has one post or more, of all the users that join 48% of them post. 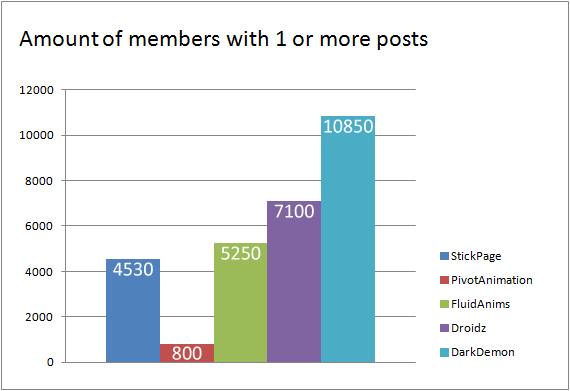 Having one post or more is hardly an active community, and it could be argued that such a high percentage is due to an influx of bots (Which it isn't), so the next criteria was examining the number of active users in each community; once a user decided to join and post, how many actually stayed within the community? Of all of StickPage's members, 1170 of them has more than 100 posts, of all the users that join only 1.4% of them stay active. 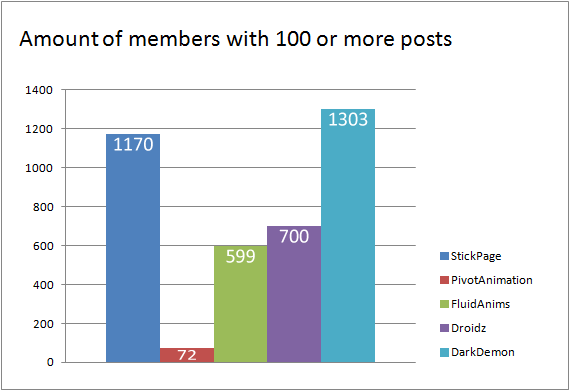 Of all of PivotAnimation's members, 72 of them has more than 100 posts, of all the users that join only 0.8% of them stay active. Of all of FluidAnim's members, 599 of them has more than 100 posts, of all the users that join 3% of them stay active. 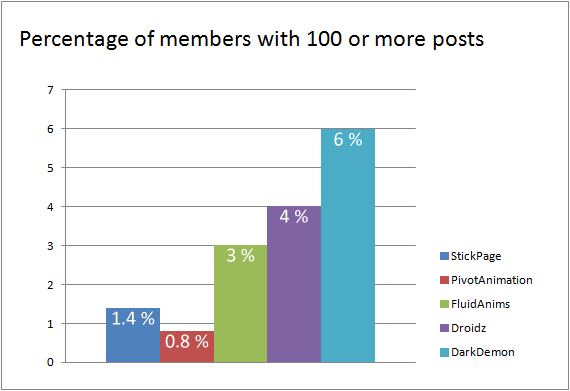 Of all of Droidz's members, 700 of them has more than 100 posts,of all the users that join 4% of them stay active. Of all of DarkDemon's members, 1303 of them has more than 100 posts,of all the users that join 6% of them stay active. Re: DarkDemon: Did you know? 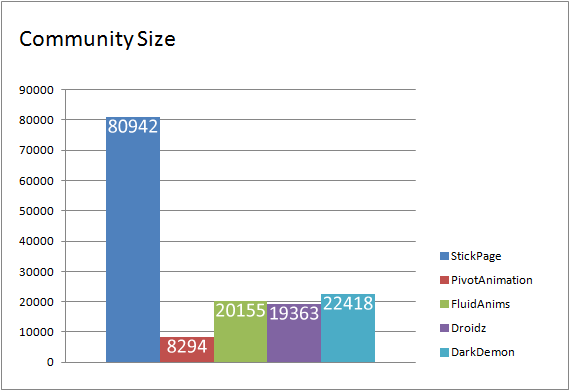 Wow, it surprised me that DarkDemon is ''more active'' than Fluidanims in the most parts. Sounds good, It seems that DD is quite popular. I see we have good statistics. @cheewbacca really???? take the First crap back to youtube. You have to take into consideration that DD has a longevity rank. This information is very interesting, and surprising. Wait, so basically we're just about as active as Stickpage, if not more? Edit: Hopefully this'll make the "DD's slowly dying" statement go ostrich and disappear in the depths of the earth. There's some really interesting stats still to come, and rest assured, whilst at the moment DD is genuinely kicking the crap out of the other forums, we fall down in user persistence (To a degree) and definitely in social media and modern day growth! That said, there's some very cool SEO facts that mean we perform a lot better than we logically should.. Looking forward to the updates now! @Darren: Dude, Adam's been gone for half a year now, Chimaera's not Adam, he just took over his job.